Chinese certification agency 3C has certified the successor to Huawei's entry-level Y7 Prime (2018). Along with the Y7 Prime (2018), 3C has also certified another upcoming Huawei smartphone bearing the model number INE-AL00r. 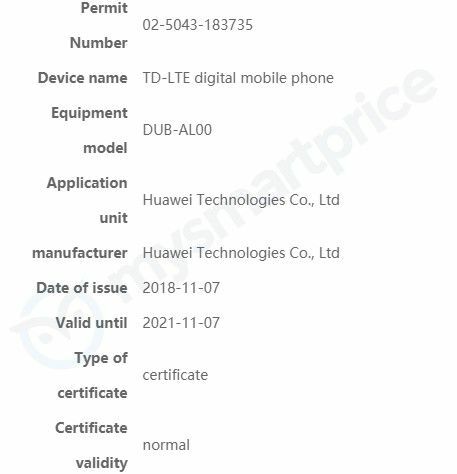 Just yesterday, we reported that the Huawei Y7 Prime (2019) had showed up on the FCC verification website. Although not a lot of details regarding the phone were revealed, we did find out that it has a 3900mAh. 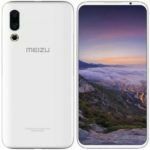 Now, the phone has leaked online once again, revealing its specifications and design. 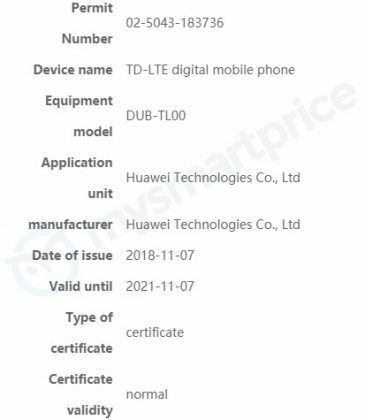 However, the Y7 Prime (2019) is also known as the Huawei Enjoy 9, which is why we didn’t catch this before. The new phone from Huawei is the successor to the Y7 Prime (2018) and brings several improvements. Firstly, the phone gets a slightly bigger display with a waterdrop notch at the top. It has a 6.26-inch HD+ display with a resolution of 720×1520. The phone is powered by the Snapdragon 450 chipset, which is paired with either 3GB RAM and 32GB storage or 4GB RAM and 64GB storage. For cameras, there’s a dual-rear camera setup placed vertically with 13MP and 2MP sensors. On the front, the device comes with an 8MP selfie camera. It runs Android 8.1 Oreo out of the box with EMUI 8.2 on top. 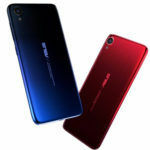 The phone will be available in four different color options: Aurora blue, magic night black, coral red, aurora purple. 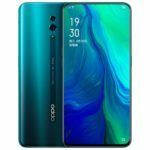 It is expected to start at CNY 1199 for the base variant, in China. 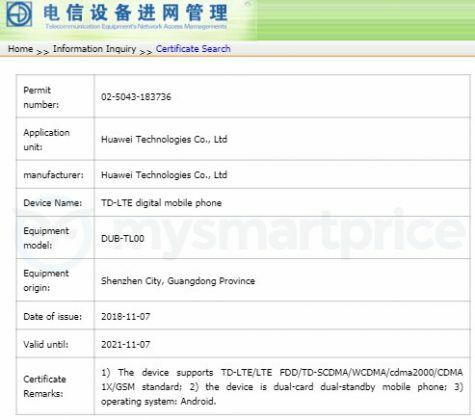 The upcoming Huawei Y7 Prime (2019) has appeared on an FCC listing revealing few details about the device. This is a budget smartphone from Huawei and is the successor to the Y7 Prime (2018) variant, which was released in March this year. 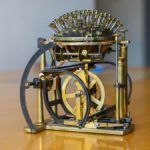 The 2019 model comes with updated internals, slightly new design, and other improvements. 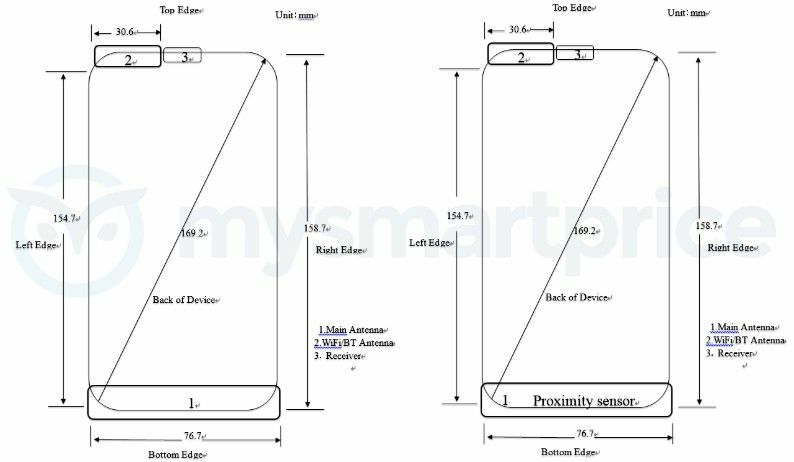 The FCC listing doesn’t really reveal any renders of the phone, but it does come with a diagram showing the dimensions of the phone. Just two days ago, the smartphone appeared on TENAA, but again didn’t reveal any specifications or images. As per the latest FCC listing, the phone has similar dimensions as the current model, but is slightly taller. This is probably because the new phone could feature a slightly larger display compared to the 5.99-inch display on the 2018 model. The image doesn’t really reveal any other details about the smartphone. However, the certification does reveal that the phone will have a bigger 3900mAh battery. You can also expect the phone to have improved internals such as a faster processor. The camera setup appears to be similarly placed as the current model, in a horizontal fashion. We expect the phone to have a dual-rear camera setup as well. 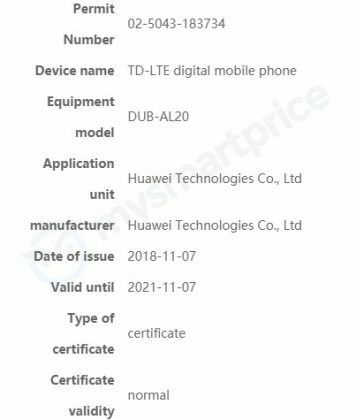 We recently reported three new Huawei smartphone models received 3C certification at the end of October. These models were DUB-AL20, DUB-TL00, and later a third model DUB-AL00 was also listed on the Chinese certification authority. Now these same exact models have reached TENAA. Their listings have gone live but we are yet to see specifications or images of any of the three devices. However, since the certification is under way, it’s only a matter of time before we see these details emerge. Furthermore, the same three variants have also been approved at MIIT. 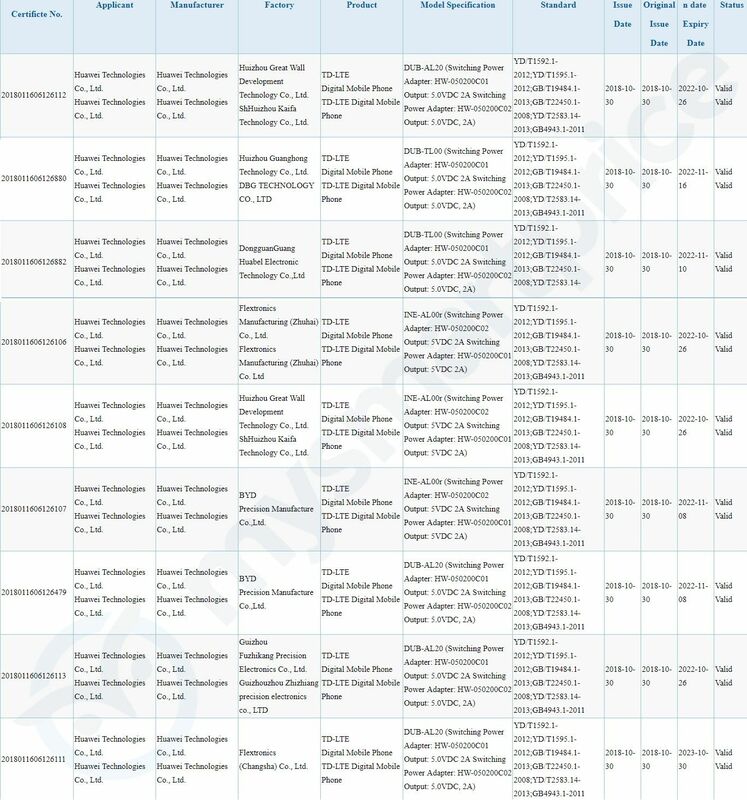 Hence, with all three major legal approvals bagged by the handset, it looks close to launch in the coming weeks. These three models are believed to be variants of the Huawei Y7 Prime (2019). 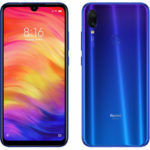 The Y7 Prime (2019) will succeed last year’s Y7 Prime which is a pocket friendly handset toting specs like an 18:9 HD+ aspect ratio display and a Snapdragon 430 octa-core processor. Its successor will presumably have a better Snapdragon 450 processor and a more hi-res screen. Stay tuned as we will update the specifications and images when they come live. 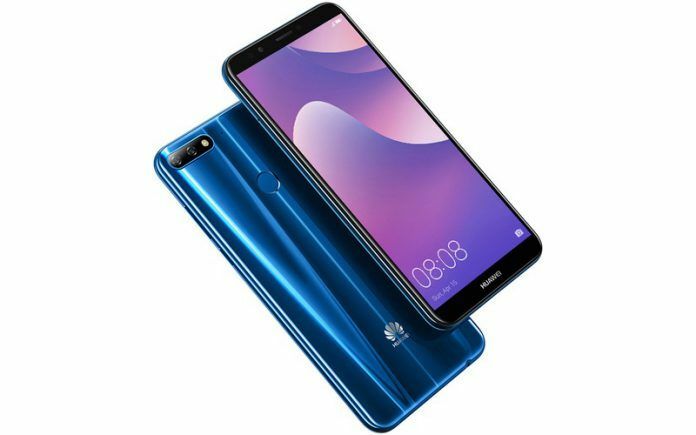 In March this year, Huawei announced the Y7 Prime (2018) entry-level Android smartphone with an 18:9 aspect ratio display and a Snapdragon 430 octa-core processor. 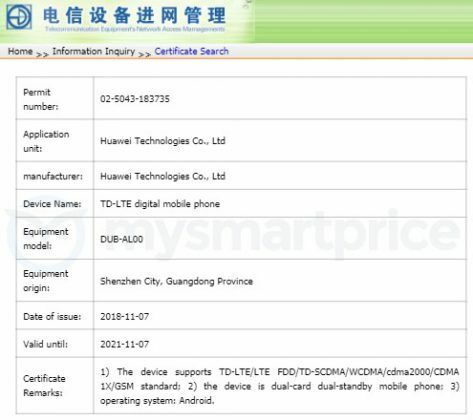 Chinese certification agency 3C has now certified the successor to the Y7 Prime (2018), bearing the model numbers DUB-TL00, and DUB-AL20. 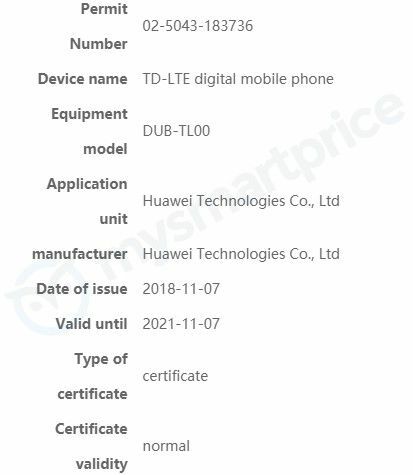 In addition to the Y7 Prime (2018) variants, a mysterious Huawei smartphone bearing model number INE-AL00r has been certified as well. After certifying the DUB-AL20 and DUB-TL00 variants of the Y7 Prime (2019), the 3C certification agency has now certified yet another variant of the smartphone. 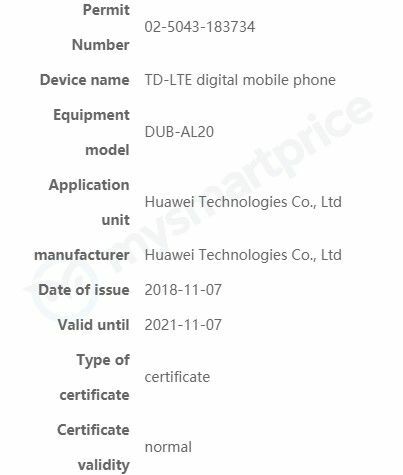 The latest variant of the Huawei Y7 Prime (2019) to be certified by 3C is the DUB-AL00. 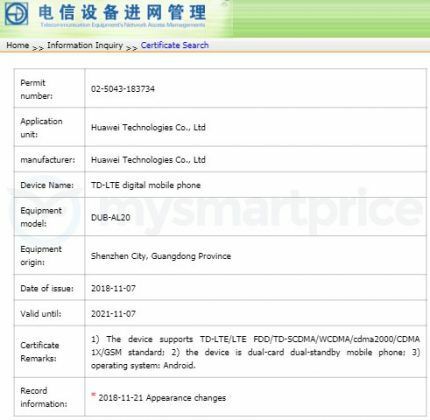 As with the previous listings on 3C, the DUB-AL00 listing does not include any vital information regarding the smartphone. The 3C certification agency in China has certified three variants of the Y7 (2019) – DUB-AL20 and DUB-TL00. 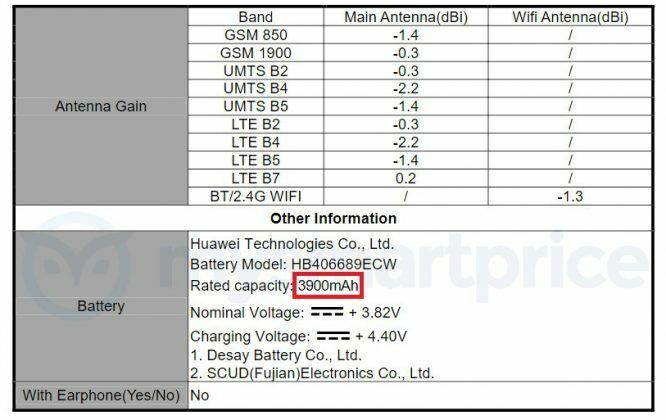 Since the Y7 Prime (2019) will be an entry-level Android smartphone, Huawei will bundle a 5.0V 2A power adapter in the box. Most entry-level Android smartphones lack fast charging support, so this is not surprising. Sadly, however, the 3C listing does not reveal any other interesting information regarding the upcoming smartphone. As for the INE-AL00r, there is absolutely nothing that is known currently. The current Y7 Prime (2018) sports a 5.99-inch IPS LCD display with 720 x 1440 HD+ resolution and an 18:9 aspect ratio. 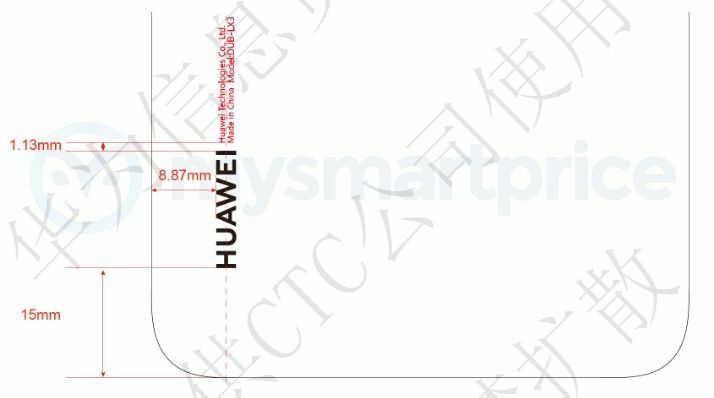 While we do not expect the Y7 Prime (2019) to come with a Full HD+ resolution display, there is a small chance that Huawei may equip the smartphone with a notch at the top, which would mean it will boast an improved screen-to-body ratio compared to the current model. In terms of processing power, the Y7 Prime (2019) is expected to run on a slightly more powerful processor than the Snapdragon 430, most likely the Snapdragon 450. 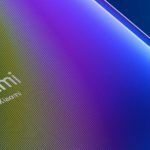 In the memory department, Y7 Prime (2019) will likely come with the same 3GB of RAM and 32GB of internal storage. 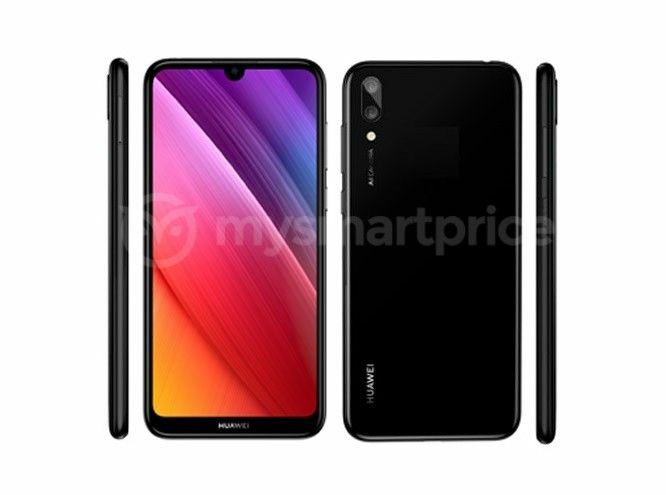 Another area where the upcoming Y7 Prime (2019) might be more or less similar to the current model is imaging. The Y7 Prime (2018) features a dual-camera setup at the rear with a 13MP primary sensor and a 2MP secondary depth-sensing camera. For selfies, the smartphone has an 8MP snapper on the front. Unlike some entry-level smartphones out there, the Y7 Prime (2018) comes with both a rear-mounted fingerprint sensor and facial recognition support. In the connectivity department, the current model supports Wi-Fi 802.11 b/g/n, Bluetooth 4.2 Low Energy, GPS with A-GPS, GLONASS, FM radio, and 4G VoLTE.